Under normal physiological conditions, the blood-brain barrier (BBB) is a physical and metabolic partition between the systemic circulation and the microenvironment of the brain, which serves to establish and maintain a highly regulated environment necessary for optimal neuronal function. The BBB is situated at the level of the cerebral microvasculature and is characterized by a lack of pinocytotic activity and the presence of "epithelial-like" tight junctions that allow the endothelium to closely regulate the passage of solutes into and out of the brain. In addition, the BBB has a number of channels and transporters that regulate the passage of nutrients into and wastes and toxins out of the brain. However, these same attributes that are necessary for proper neuronal function create a formidable obstacle for the entry of pharmaceutical agents into the brain; therefore, many CNS-associated pathologies (neurodegenerative diseases, multiple sclerosis, and stroke) are under-treated or not treated at all. My research focuses on two facets of BBB research: improving drug delivery to the CNS and characterizing the functional and structural integrity of the BBB in health and disease. Age is a paramount risk factor for ischemic stroke. The impact of age and its relationship to the development of ischemic injury is an understudied, yet critical, area for investigation that serves the missions of NINDS and NIA by gaining a better understanding of stroke pathophysiology and the opportunity for improved therapeutics. The long term goal for this proposal is to improve the outcome of patients whom have suffered a stroke. As a necessary first step, we will obtain a functional and structural characterization of the blood-brain barrier (BBB) following an ischemic episode in aged rats as a means to assessing and developing therapeutic options that can be effective for people as well as laboratory animals. The rationale for the proposed research is that current animal stroke models do not adequately address age-related changes in the BBB; thus, hindering the ability to translate promising stroke therapies from the lab to the clinic. The objective of this application is to determine the impact age has on functional and structural changes occurring at the BBB following middle cerebral artery occlusion (MCAO) and reperfusion with tissue plasminogen activator (tPA). Our central hypothesis states that age is a significant risk factor in ischemic stroke that leads to increased perturbations in BBB function, characterized by increased permeability and alterations in endothelial cell-cell contacts. We propose three specific aims to test our hypothesis: 1. 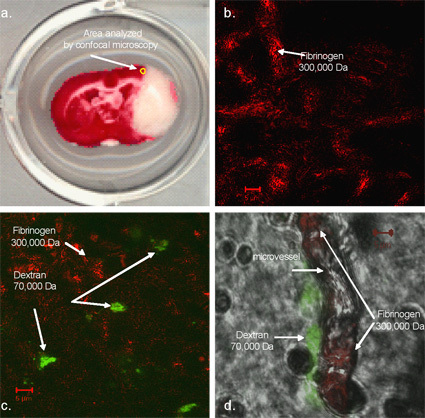 Investigate relative size and regional localization of blood-brain barrier functional changes following MCAO and tPA reperfusion in aged rats using in situ brain perfusion and confocal microscopy. 2. Identify BBB tight junction regulatory proteins [occludin and zonula occludens-1 (ZO-1)] following MCAO and tPA reperfusion using electrophorectic techniques and confocal microscopy. 3. Evaluate the effect of pharmacological modulation of BBB during MCAO and tPA reperfusion in aged rats using in situ brain perfusion. We expect that these findings will clearly show that age has profound effects on BBB function and structure that must be taken into account when developing and screening therapeutics to reduce stroke morbidity and mortality. Stroke is a disease of the elderly. Using an animal stroke model that takes age into account will have an impact in our gaining a better understanding how stroke affects the brain and provide a clinically relevant model for assessing potential neuroprotectants. Figure depicts a TTC stained brain slice from an aged rat following MCAO and reperfusion. The yellow circle (A) denotes the area assessed by confocal microscopy. (B) This is an confocal (100x) image of fibrinogen (red) and dextrin (green) flourescent reactivity in aged rats (18 months) that underwent a (B) sham MCAO and tPA reperfusion or (C) underwent a fibrin clot MCAO and tPA reperfusion. (D) This is a confocal image (100x) with bright field that depicts the lumen of the cerebral microvessel. Within the lumen, fibrinogen reactivity (red) can be observed in the lumen of the vessel while dextran reactivity (green) is seen along the outer surface of the vessel in an aged rat (18 months) that underwent a fibrin clot MCAO and tPA reperfusion. Endothelial cell dysfunction associated with microangiopathy is a primary factor in the development and progression of diabetes mellitus (DM)-related disabilities, including blindness, kidney failure, and peripheral neuropathy. While much is known about DM-induced microvascular alterations of the kidney and retina, the role DM plays in cerebral microvascular pathogenesis is understudied. Recent clinical evidence suggests DM-induced changes in the blood-brain barrier (BBB) lead to increased incidences of vascular dementia, ventricular hypertrophy, lacunar infarcts, hemorrhage, and may be a predisposing factor for Alzheimer's disease. Our long term goal is to obtain a functional and structural characterization of the cerebral microvasculature during DM, in order to provide insight into better, safer approaches to improving the clinical outcome of DM. The objective of this application is to determine the impact DM has on the functional and structural changes occurring at the BBB during DM. The rationale for this study is that complications of DM are associated with alterations in microvascular function; however, the BBB remains largely unstudied. Preliminary data suggest that BBB function and structure are altered during DM and characterized by increased BBB permeability, regions of greater susceptibility, and alterations in the interactions of the tight junction regulatory proteins occludin and zonulae occludens-1 (ZO-1). Our central hypothesis states that DM leads to progressive deterioration of BBB integrity, characterized by increased permeability and alterations in endothelial cell-cell contacts. Specific Aim 1: Investigate relative size and regional localization of BBB paracellular changes during DM. 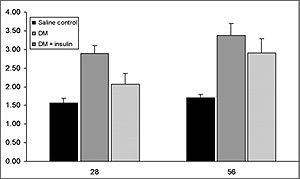 The working hypothesis is that DM induces a progressive deterioration in BBB function, characterized by increased paracellular permeability and a greater number of brain areas affected as compared to age-matched controls. Specific Aim 2: Identify changes in tight junction regulatory proteins (ZO-1 and occludin) during DM. The working hypothesis is that DM induces an increased deterioration of BBB cell-cell contacts, characterized by changes in ZO-1 and/or occludin expression and localization as compared to age-matched controls. The proposed work is innovative because it addresses the significance of BBB functional and structural deterioration during the onset and progression of DM. It is our expectation that the results of this application will clearly show that DM has profound effects on BBB function and structure that must be taken into account when assessing the pathophysiology of long term DM-induced complications. These results will be significant because they will serve as the foundation for a programmatic effort to better assess CNS complications in diabetic patients and serve as the basis for future NIH funding. Major complications associated with DM are manifest in damage to the vascular system, leading to decreased quality of life for those who suffer from the disease. Due to the progressive nature of DM and the unique characteristics of the BBB, effects of DM on the cerebromicrovasculature are, in many ways, different from other microvascular beds and barrier systems, such as seen at the retina and peripheral nerves. Often the adverse effects seen at the BBB can be more insidious as vascular dysregulation is less perceptible at first and by the time clinical signs are noticeable, neurological damage has occurred. Understanding how DM progressively alters BBB function and structure is an under investigated yet important area of DM-related research. We expect this proposal is a start toward addressing this need and our lab is uniquely qualified to carry out this research.